I am becoming more confident that Kate’s asking for permission is as much or more her asking “what should I do?” rather than “what may I do . . .?” It seems to be a little of both. I think she is unsure of herself and looks to me for guidance. Clearly, I do correct her on some things, so I do think she wants to please me. I don’t, however, see any sign either in the tone of her voice or the look on her face that seems to convey any resentment, just wanting to know what she should do. Tonight we had another very peaceful and very pleasant evening together. We always do. We had spent almost an hour at Panera that was very relaxing. Then almost another hour at dinner. As we waited for our pizza, she looked over at me and said, “You know you’re the most important person in my life.” I suspect that is something that every caregiver would like to hear. Then we came home where she worked on her iPad while I watched the evening news. The next thing I knew it was 8:45. I went to take my shower. She continued with her iPad. While I was in the shower, she opened the door to the bathroom and in a soft voice said, “Richard.” I said, “Yes.” Then she asked, “Can I get ready for bed now?” As always, I said, “Yes.” She is now in bed while I write this post. Chris Botti is playing on my sound system. It’s been another good day. I think I’ll join Kate. Kate’s cold continued today with no clear sign that the antibiotic has made a difference. She was ready for Panera just before 10:00 but was a little slow and not in a jolly mood. She didn’t change much over the time we were there or out time at lunch. When we drove into the garage at home, she said, “What now?” I told her we could go in and brush our teeth and then relax a bit. She didn’t say anything but seemed to accept my suggestion. Once inside I brushed my teeth and got ready to go to the Y. The sitter was due to arrive in about 15 minutes. When I hadn’t seen her I a few minutes, I went back to the bedroom we call her room. She was in bed resting. I let her rest and went to the kitchen. In a few minutes, Mary arrived. I told her Kate was resting and that she could go back to say hello. She did and then returned to the family room. Before I left, I went back to tell Kate I was going. When I did, she asked, “What am I going to do?” I told her that she and Mary could go to Panera if she wanted or she could rest a while at home. She said she wanted to go to Panera and got up right away. We met Mary in the family room, and I told her Kate was ready to go out. She said she wanted to use the bathroom before they left. As she left the room, I said good buy and walked to the car. I was about to back out of the garage when Kate walked out. I watched to see if she got in Mary’s car. She gave me a sad look and said, “You’re leaving me.” I said, “But you and Mary can go to Panera.” Then she said, “But I’d rather go with you.” I told her I would rather be with her too. She turned to get in Mary’s car, and I left. This is the kind of thing I thought could happen and until now hasn’t. I suspect it would not have happened this time if Mary were present. In fact, she was not just cordial when Mary arrived but seemed glad to see her. I obviously wish that Kate hadn’t felt this way, but she did not appear to be deeply hurt at all. She just would have preferred being with me rather than Mary. When I think of it, that’s a good thing. I’d be hurt if it didn’t matter at all. When I returned home, Kate and Mary were in the family room. They had been to Panera though I don’t think they spent the whole time there. I thanked Mary and told here we would see her next week. I turned around to see that Kate was ready to leave. It was an hour before we would go out for our Friday night pizza, so we went back to Panera which is where we are right now. Our lives follow a pretty predictable routine. That is largely because I am a creature of habit. I have also tried to create a clear structure for Kate, and it seems to have worked. Not today though. As I noted in my previous post she has a cold. Yesterday and the day before, she awoke much earlier than normal and did not rest during the day. Today she made up for her lack of sleep. I decided to let her sleep as long as she could since we had no obligations to be anywhere or do anything on a set time. To my surprise, she didn’t wake up until 12:45. It was a little late to go to Panera for her muffin. We went directly to lunch, arriving at almost 2:00. She wasn’t in the best of moods, and I tried not to do or say anything to aggravate her. My big mistake occurred when she blew her nose on her jacket that she has only worn two or three times. I quickly said, “Don’t do that.” I told her I would get her a paper towel. I normally keep them in the car, but we had run out the day before. She snapped back at me. Then she apologized, and I, too, felt bad and apologized. After lunch, I asked her if she would like to go back home. She said, “Barnes & Noble.” After we had been there about 45 minutes, she said she had a headache. I asked if she would like to go home. She did. When we got home, I gave her a Tylenol. We brushed our teeth. Then she grabbed her cup and said, “I’ll see you” and walked to the front of the house. When I got to the kitchen, I didn’t see her. I looked in the garage and saw her sitting in the car waiting for me. Nothing at all had been said about our going back to Barnes & Noble, but she was obviously ready. I got in the car, and here we are again. We had only been home a few minutes. I see that it is now almost 5:15. If I follow our usual schedule, it will be time for dinner in 45 minutes or so. I will probably delay that a little tonight since we ate lunch so late. Yes, it’s a different kind of day. Kate surprised me when she decided she was ready to leave Barnes & Nobel shortly after I wrote the post above. Although we had eaten a late lunch, we talked about whether to go home or to eat. We decided to eat but to have a light meal. We went to the Bluefish Grill where we shared an appetizer and an entrée. As we entered the dining room, we saw one of my Rotarian friends. As we were eating, some friends stopped by our table on their way out. We also saw a couple from our church. We had a good meal and a nice social experience as well. When our server asked if we wanted dessert, I said, “I don’t think so.” Kate looked at me and said, “We could share something.” I agreed. This happens occasionally when I don’t want a dessert. I had picked up a couple of pounds over the past week when our son was here. I really didn’t need anything more; however, I often imagine how I might some day look back on moments like this. I think I would say, “I wish I had just enjoyed the moment rather than worrying about my weight.” I continue to believe that is the right thing to do. On the way home, Kate said, “I never get tired of being with you.” She followed that with “Sometimes I get irritated with you.” I said, “Thank you for loving me.” She closed the conversation with this comment. “I do love you. I don’t know why, but I do.” The day is ending on a high note as it always does. Two days ago, Kate had a routine doctor’s appointment. It was a timely one in that she had caught a cold that I had had during the previous week. In addition, she has complained of a pain in her knee for several weeks. She had said it was mild, but in the past two weeks it has led to her walking more slowly as well as getting into and out of the car more slowly. Dr. Reynolds listened to her lungs and asked her to cough. He decided to put her on an antibiotic and to let him know if the cough persisted after she finished taking it. As of last night, her symptoms had not changed; however, I am glad that we were able to address it quickly. She went to bed a little earlier last night, and she is still sleeping right now at 9:30. That is good since she was up unusually early the past two mornings. I am hopeful that she will make some progress in the next day or two. As for the pain in her knee, the doctor believes it is arthritis and recommended that she take Tylenol as needed. I hope that will address the problem. I also wonder if part of the problem arises from lack of exercise. She spends most of her day in a sitting position since she has not been working in the yard. I am going to encourage her to do a little more walking. I’ve already mentioned that to her, and she was receptive. The balance of the appointment involved the normal procedure. Dr. Reynolds asked her to tell him how she thinks she is doing. She said, “Fine.” He asked her what she does with her time. The first thing she said was that she works on family photo albums. She hasn’t worked on photo albums for at least two years, but this is a customary response when someone asks her about her activities. She didn’t mention working jigsaw puzzles on the iPad, but I did. Until now, the doctor has scheduled Kate’s appointments every six months. This time he set the next appointment for four months. He asked both of us if that would be all right. We agreed. Of course, I don’t believe Kate thought anything about this change. I believe he was reacting to an email I sent him prior to our appointment in which I outlined the changes that had occurred since her previous visit. I also wondered if his suggestion of four months indicates an expectation that she may be entering a stage at which change is more dramatic than in the past. Here are a few excerpts of my email to Dr. Reynolds. 1. Her memory has declined. Although she used to have trouble with most people’s names as well as our grandchildrens’ names, she is now losing the names of our children. It is not unusual for her to ask me the names of our son or our daughter. Just moments later, she is likely to ask again. It’s not just people names. She is also forgetting that we are in Knoxville. She often asks, “Where are we?” or “Where am I?” when we are in familiar territory. In most cases, she means, “What city are we in?” Sometimes she means the restaurant where we are eating. We go to Panera almost every day. Several times recently, she has asked me the name while we are there. She often says, “Does this place have a name?” I believe that most of the time she does not know what city she is in or what place (restaurant, church, etc.). 2. She has become more dependent on me. She regularly asks (frequently with hand not her voice) questions like “Should I put on my night clothes?”or “Should I go to bed now?” The other day at a restaurant, she asked (in hand signals) if she could take a drink of her iced tea. Although I have ordered her meals in restaurants for several years, she occasionally tells me to order for her. If I give her a choice of options, she often throws it back to me to make the choice. 3. She is more compliant. She accepts more of my suggestions than she used to. I notice that especially with her clothes. If she is wearing something that is inappropriate for the occasion or if it is soiled, she is more willing to change than before. She also takes more suggestions from me without putting up a fuss. One area in which she continues to do well is in short-term social interactions. Both family and friends are still amazed at how well they think she is doing when they have been with her a short time. I am very grateful for this. It means that we can go places, and she seems to be normal. I think this helps other people respond to her in like manner. One other comment. During the early stages of the disease, Kate was quite frustrated over her symptoms. She displays little or no frustration now. She is happy and generally good-natured. I am grateful for that. We never talk about her Alzheimer’s. She has simply chosen to go ahead and live her life as though she doesn’t have the disease. Although I would have chosen a different approach for myself, I am comfortable with her choice. Especially at this point, I see little reason to inform her of where she is headed. Next week marks seven months since I started in-home care for Kate. We began with four hours on each of three days a week. We continue with that same schedule. As it turns out, we have had to miss a few days over that time. Some of those days were a result of holidays, our own travel or other obligations, and on a couple of occasions when a sitter could not be here. I was very skittish about introducing a sitter fearing that Kate would not think she needs someone to be with her. I agonized over how I would present this to her. Because I knew that she wouldn’t remember if I told her in advance, I decided not to say anything until a few minutes before the sitter’s arrival. I had, however, mentioned on a number of occasions that I was feeling uncomfortable leaving her alone when I had to go out. Just before the sitter’s arrival, I told Kate that I was going to the Y and that I had arranged for someone to stay with her. She asked me why. I reminded her that I had become increasingly uncomfortable leaving her and that I would feel better if someone stayed with her. She surprised me by saying, “Okay.” That was it. When the sitter arrived, Kate greeted her warmly. I was relieved. We have two different sitters, one who comes on Monday and another who comes on Wednesday and Friday. That has worked well. Several weeks ago, I mentioned that Kate did not display her usual enthusiasm when the sitter arrived or left. This occurred during or right after Kate had had the flu. I thought that the change in her response might have been connected with her illness. I am glad to report that I must have been right because she has returned to her earlier way of relating to each of them. That has been especially true for the past few visits. That has made me feel better each time I leave her. I bought a gift card for Panera for the times they would like to go there for a break. Until the past week, I believe they have gone to Panera every day the sitter has been here until the past week. It is now three days in a row that Kate chose to stay home. She has a cold and has been feeling a little sluggish. I suspect that is the reason. Kate is actually more comfortable with the arrangement than I am. I’m not sure exactly why. I think there are two possibilities. One is that I have been her sole caregiver and understand her better than someone who hasn’t had the same experience with her. The other is that I don’t like relinquishing my role as a caregiver. It means spending less time with her and is a precursor to my playing a lesser role in the future. I find that this is less of a problem for me on Mondays when I easily fill up the four hours with my Rotary luncheon, a trip to the Y, and a stop by the grocery store. On the other days, I have time for the Y and then meet my friend, Mark Harrington, for coffee. On days when my only agenda is the Y, I have more time to myself and spend it at Barnes & Noble or Whole Foods. That is when I am least comfortable. I have the feeling that I could be at home with Kate rather than working on my computer elsewhere. In time, this feeling will probably ebb. Just recently, I have found myself juggling various responsibilities in a way that could turn out to be frustrating. Having a little time to myself might be of benefit. Kate’s asking permission for things that she shouldn’t need to ask continued at dinner tonight. When we were about halfway through our meal, she asked me (with hand signals as she often does) if she could drink her iced tea. Up to this point, she had already drunk about a quarter of the amount in her glass. I asked why she was asking me. Then I said, “You don’t have to ask me to drink your tea.” She said, “I thought so. I just wanted to make sure.” Before we had finished eating, she asked me the same question two other times. She had salmon tonight. When she had eaten about half of it, she asked if she could eat it. I said, “Yes, you can eat it. You don’t even need to ask.” Once again, she told me she “just wanted to make sure.” Nothing in the tone of her voice or the expression on her face suggested kidding me or acting as though I am a tyrant, but it does make me feel uncomfortable when she does this. It also makes me want to be more careful about those things for which I correct her. I may be overdoing it. On the other hand, it may simply be a sign that she doesn’t know what to do and appeals to me to help her. I hope it is the latter even though it saddens me to acknowledge that possibility. I don’t like to see her growing dependence. I prefer it when she seems to fight for her independence. These days that happens most often when I offer my hand as she steps off a curb. At night, she is almost always glad to accept. For some time I have noticed that Kate sometimes likes a particular food item one time and dislikes it at another. At first, I thought she might be picking up on variations in the way the food was prepared. Then I began to realize there is just an unpredictable variation in her perception of taste. Last night, for example, she had a cheese quesadilla and a cheese burrito at Chalupas. After she took her first bite of the quesadilla, I asked her how she liked it. She said it was delicious. In a moment, she took another bite. Then I noticed that she only took bites of the burrito. When I asked about the quesadilla, she said it had a funny taste. Even more surprising is what appears to be her changing taste for Dr. Pepper. It has been her favorite drink since before we met 56 years ago. She has always been sensitive to the mixture of the Dr. Pepper syrup and carbonated water that she gets from dispensers. Now she is finding that her drinks don’t taste the way they should even though I can’t perceive any difference from the way they should taste. Three times in a row this week (at three different places) she has complained to me that the Dr. Pepper didn’t taste right. Just a few minutes ago, I gave her a glass of water. She told me it had a “funny” taste and isn’t drinking it. Fortunately, her judgments about food don’t extend to everything she gets. She is still eating well. We just returned from lunch. She enjoyed her sandwich, soup, and, especially, the salted caramel gelato. We returned from dinner about thirty minutes ago and have settled into our bedroom where I am watching the evening news and Kate is working jigsaw puzzles on her iPad. It is a normal evening for us except for her asking my permission to do two things that she would not usually ask, and certainly aren’t required. First, she asked if she could sit in her chair. I naturally said yes. Then she thanked me, and it was a genuine thank you. Right after that she asked if she could put on her robe. Again, I told her that would be fine, and, again, she thanked me. Several times lately I have wondered if I am appropriately using the word “permission.” It could also be that she is simply asking because she doesn’t know what to do next. After reflecting, I believe that both interpretations may be correct. I mean that on some occasions she is asking if it is all right for her to do something. This has happened most often when she asks, “May I work in the yard?” Or “Can I use the clippers?” There are other situations in which she primarily uses hand signals to ask something. The best illustration would be pointing to her iPad and to herself to ask if she should take her iPad along with us when we are leaving the house. It also happens when she points to her cup in the car and the to the restaurant at which we have just arrived. In this case, I believe she is asking if she should (not may) take her cup in as she does at Panera or Barnes & Noble. What strikes me most is her really asking permission. 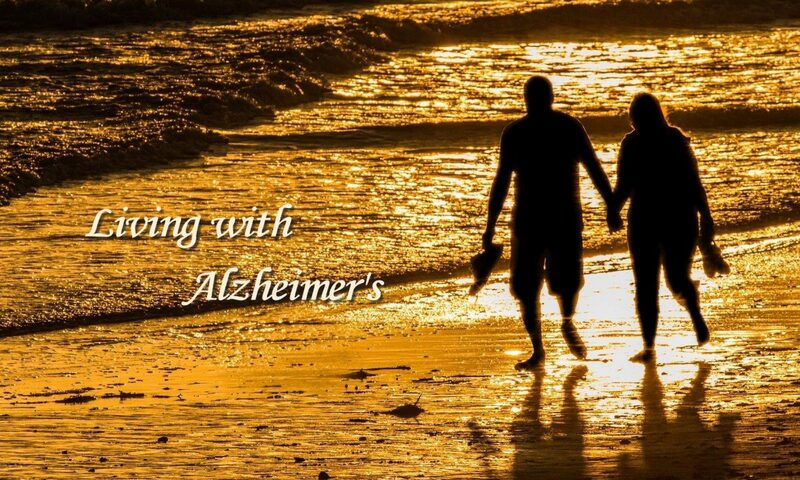 I like to think that the nature of our relationship that was established long before her Alzheimer’s would make such requests unnecessary. In addition, nothing other than the words she uses suggests that she sees me as a tyrant. On the other hand, I acknowledge that there are many things about which I correct her. Typically, that involves the clothes she wears. Although I usually let her wear whatever she wants, I frequently have to let her know that what she is wearing is not the best because of the weather, the occasion or that she has her clothes on inside out or backwards. Regardless of the reason for her asking, it saddens me to see it happen.